So what is hydrotherapy? Hydrotherapy is the treatment of illness or injury through the application of water of any temperature or form. Immersion in cold or warm water causes specific reactions in your body which help in reducing inflammation, soothe stiff and sore muscles or can simply help a person relax improving ones mental health as well. It has been around for many years and has been a fixture in many cultures. Sebastian Kneipp, commonly referred to as the father of hydrotherapy, experimented on several methodologies over his lifetime and wrote books outlining his methods. Much of his work laid the foundation of modern hydrotherapy methods. So how does this work? Cold baths stimulate the body by constrict blood vessels in your skin which slow inflammation in injured areas and desensitizes the sensation of pain. Warm baths relax the body and mind. Blood vessels open up increasing blood flow to the skin and muscles easing aches and pains. Hydrotherapy for the most part revolves around water temperature. Either combining differing applications at the same time or alternating between hot and cold, but the simple act of being submersed in a weightless state can give relief to aching joints and muscles. A more recent addition to hydrotherapy methods is the use of directed water and infusing bubbles into your soak. The streams of water and bubbles act as a very gentle massage adding to the relaxing nature of your immersion. Arthritis and lower back pain are probably the two most common ailments treated with hydrotherapy. Standard tubs give you some of the benefits right there in the home but they lack some features like water jets/bubbles. To get those you’d have to visit a spa or clinic. 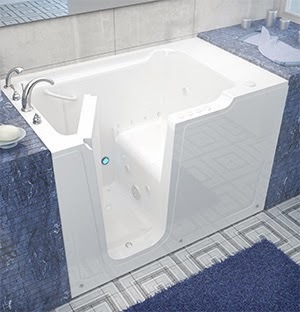 Thanks to the expanding popularity of walk-in style tubs most anyone can enjoy the benefits of a full hydrotherapeutic experience in the comfort and privacy of your own home. If easy and private hydrotherapy are of interest to you don’t hesitate to contact K-Designers. We sell a variety walk-in tubs and standard tubs. Call us at 800-728-3902 or visit us online www.k-designers.com to get your free quote!